Emma’s been eating “solids” for about four months now, so I figured it was time to share a little bit about how and what she eats. If you’re not familiar with Baby Led Weaning, the elevator pitch is that you skip purées and go straight to “grownup food,” which gives babies the opportunity to self feed and generally makes life easier on you as parents. It’s very possibly the lazy way to feed your baby real food. And I’m totally on board with that. 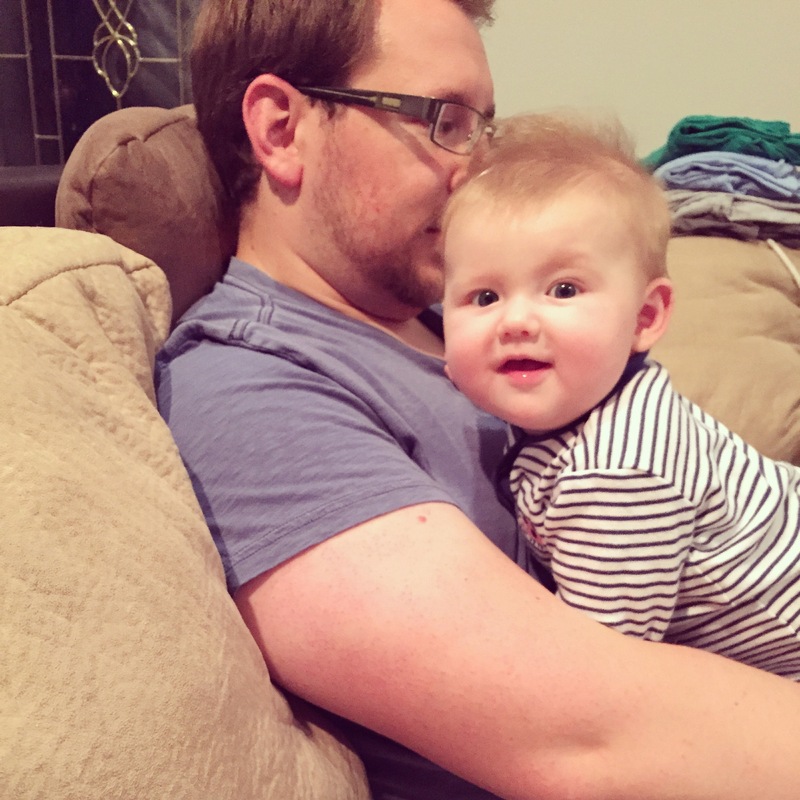 I plan to do a full post on the hows and whys of BLW eventually, but for now I’ll just share a few things that have made our BLW journey a little easier. 1. Bibs with pockets: We use both of these bibs. The Oxo version usually lives in the diaper bag for restaurant meals and the Tommee Tippee version stays at home. The best part of each of them is obviously the pocket- most of the food that gets dropped by little fingers (or ejected from a little mouth) lands in the pocket. Then when she runs out of food, we scoop up whatever’s in the pocket and put it back in front of her. Recently she’s discovered the pocket and its food-catching abilities and she’ll feed herself right out of it. The perfect pocket bib would be a mashup of these two: the softer silicone of the Oxo (and its fold-up ability) paired with the all-one-piece silicone design of the Tommee Tippee. 2. EZPZ Happy Mat: I have a real problem when it comes to Kickstarter. There are so many ingenious ideas out there, and sometimes I just get sucked into the black hole that is Kickstarter and I’m ready to back all the things. The Happy Mat is one of my most recent Kickstarter backs. It sticks to the table with magic suction. We do use it, but honestly it’ll be a better solution for when she’s older- for now, she can’t quite reach all of the compartments. But I still think it’s totally awesome and I wanted to tell you about it. 3. Stokke Tripp Trapp: I fell in love with this highchair when I was pregnant and wrote it off as something we wouldn’t be able to purchase because it’s pricy, y’all. But lo and behold, people offload these on Craigslist all. the. time. It was just a matter of waiting and stalking before I found the perfect one! We love it because it pulls straight up to the table—no need for a tray— and it’s super easy to clean. Also, it will grow with her so she’ll be able to use it long after she’s left the highchair stage. And it’s pretty good-looking, no? 4. BLASKA Dust pan and brush: Here’s the thing about BLW: it’s messy. Like super messy. I’ve heard people say that if your kid and your floor aren’t a mess, you’re doing it wrong. So this little broom + dustpan set has been really useful for us. Plus, you know, it was $1.49 at Ikea. I hear that having a dog also helps with the whole floor-cleanup thing. 5. Green Sprouts Glass Sip ‘n Straw cup: We really try to stay away from plastic in the kitchen, given concerns about BPA and other potentially harmful components. I didn’t think I would be able to find a glass sippy, but this one has a plastic sleeve outside and glass inside, so it works well. It’s pretty durable so far, but not totally leakproof, so I don’t know that I’d put milk or juice in it and just throw it in my bag. We also have the stainless Safe Sippy 2, but I really prefer to be able to see what’s inside and I just think water tastes better in glass. Emma hasn’t quite figured out the straw learning curve yet, but she’ll get the hang of it eventually. Since all of her hydration still comes from breastmilk, I’m not in a hurry for her to use the cup. I also just learned about SipSnap lids, which are little silicone lids that fit over any cup and turn it into a straw cup or sippy. Perfect for mason jars! I may have to order a set and try them out. I’m thinking they would work well for grownup smoothies and iced coffees in said mason jars, too. 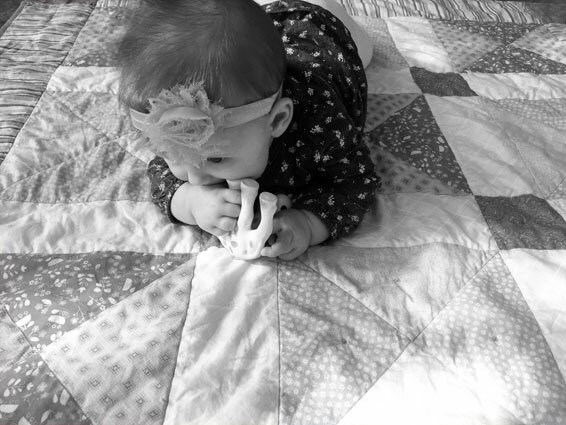 This entry was posted in baby, real food, things i love and tagged baby gear, baby led weaning, BLW on March 6, 2015 by Audrey Steinbach. 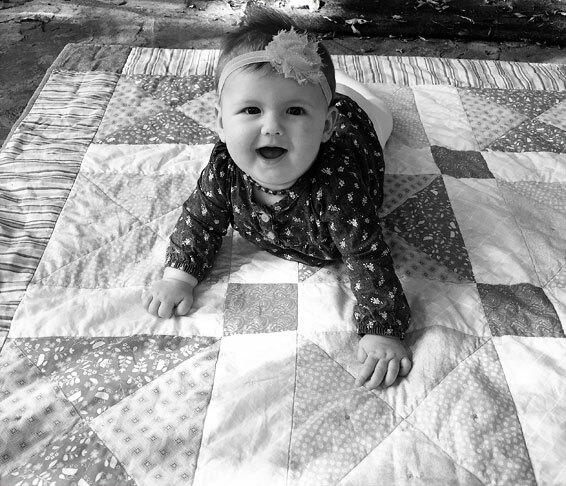 It’s so hard to believe that our Emma is five months old already! I know it sounds cliché, but babies just grow up so fast. she loves smiling and is a world-class drooler. our favorite toys right now are Sophie, the Very Hungry Caterpillar (similar), and the Oball rattle. 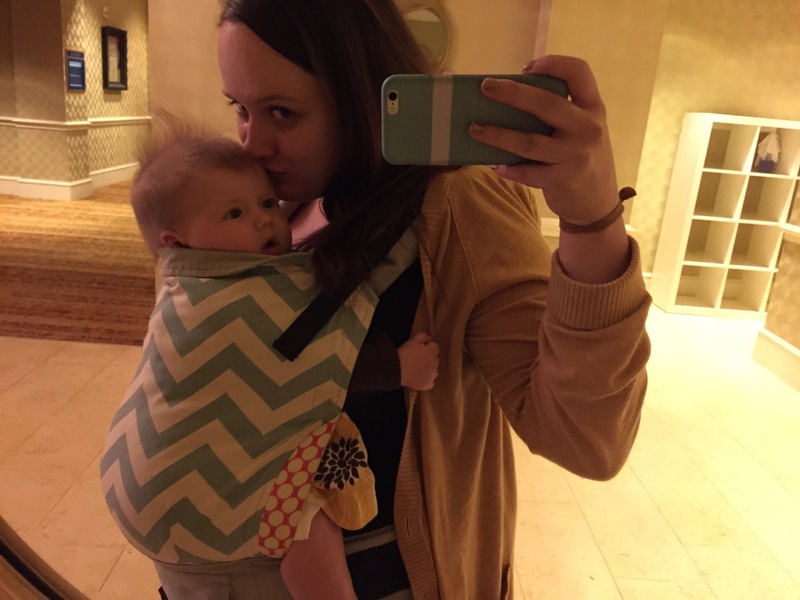 current gear fav is our Tula baby carrier. it’s so comfortable and cute! her favorite time of day is somewhere around 5:45 pm, a.k.a. the moment Dad walks through the door. she lights up like the fourth of July as soon as she sees him! it’s so fun to watch. nicknames include chubs, chubster, chubby bubby, and emster. This entry was posted in baby on October 14, 2014 by Audrey Steinbach. 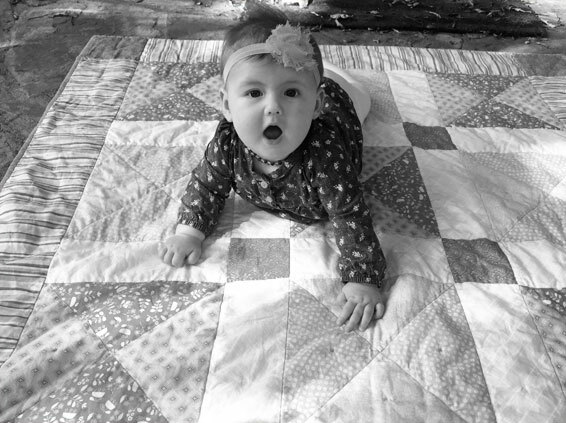 We’re long past the newborn days, seeing that our sweet E is almost five months old now (WHAT? HOW? ), but I thought I might share some of our favorite things from that stage. I spent hours agonizing over our registry- reading reviews, comparing products- and in the end it’s true that all your baby really only needs warm clothes, diapers, a safe place to sleep, something to eat, and YOU. That said, there are a whole lot of things out there that make your life easier in some fashion or another. These were our favorites! 1. Lifefactory Glass Baby Bottle – We’re breastfeeding successfully now, but because of Emma’s time in the NICU the beginning of that relationship was rocky. I pumped and bottlefed for a few weeks. We still use these occasionally, but not as much as we anticipated since I ended up not going back to work. I love the fun colors and the fact that they’re made of glass. 2. Honest Company Diapers – We cloth diaper most of the time, but when she was first born our one-size cloth diapers were too big. Plus during the newborn stage there are a LOT of diapers, am I right? I love the cute patterns on the Honest Company diapers and the fact that they’re eco-friendly and chlorine-free. 3. Happy Baby Wrap Organic Bamboo Baby Carrier – A lot of people swear by the Moby wrap for infants, but it was just too much fabric for me, especially with a summer baby. The Happy Wrap is made of stretchy, breathable bamboo and comes in great colors and adorable patterns. We loved it! 4. aden + anais Classic Muslin Swaddle Blanket – These are stretchy, breathable, and huge- perfect for swaddling. Also perfect for covering a sleeping baby’s carseat, acting as an emergency changing pad or spitup rag… so many possibilities! 5. Nosefrida Nasal Aspirator – I much prefer using this over the traditional bulb syringe. I would love to say that Emma prefers it too, but honestly booger-sucking time may be one of her least favorite activities! 6. WubbaNub Giraffe – Opinions on pacifier use are definitely widespread, but E started using one in NICU and really loved it for the first few months. The weight of the WubbaNub helped keep the paci in place so that when she spit it out it didn’t go flying across the room. A lifesaver for a tired mama in a dark bedroom! 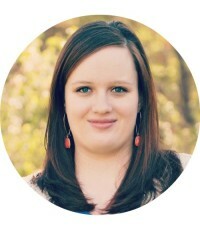 This entry was posted in baby and tagged baby, newborn, registry on October 3, 2014 by Audrey Steinbach. This is our sweet baby girl Emma Noelle. She made a rather dramatic entry into the world that included 60+ hours of labor and 6 days in the NICU. While I honestly could have done without all that, it’s her story and she is strong and brave and beautiful and I can’t wait to tell her all about it someday. The first few weeks were somewhere in between a haze and a blur of eating, sleeping, snuggling, staring at her beautiful face, and listening to her baby squeaks and grunts. And occasional screams- we didn’t realize just how much those screams would echo thanks to the wood floors and tall ceiling in our old living room! Emma is almost five months old now and we are having the time of our lives! It’s not all fun and games, of course, but we’re thoroughly enjoying this phase of her life. When we told our friends that Emma was on her way, one of them said, “It [having a baby] will change your life forever- in all the best ways.” Such true words! We can’t imagine life without her- and we wouldn’t want to.